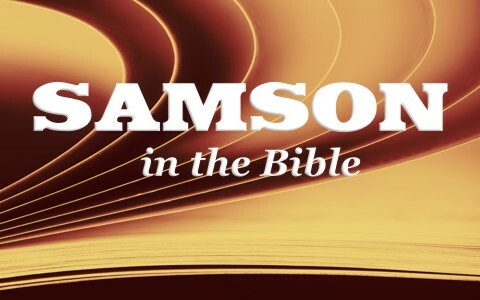 Who was Samson in the Bible? How did he die? It seems that we are living in the very same society today as the Israelites where living in during the time of the Judges where “Everyone did what was right in his own eyes” (Judges 21:25). When the people begin to do what they think is right, then what God says becomes less and less important. Eventually, God’s not even in the conversation. This was after the death of Joshua and no clear ruler emerged. Israel fell into a vicious cycle. They would prosper, begin to ignore God’s laws, they would fall into pagan idolatry, and then God would send another nation to afflict them. When they finally repented, God sent them a Judge, chosen by God, to lead them out of their affliction or perhaps temporary captivity. This cycle repeated itself for several generations until Samson was chosen. What is a judge? In the ancient days, before there was a king in Israel, there were successive judges who ruled over Israel. They were usually a ruler or a military commander, but in either case, they were charged with Israel’s obedience to the law of God. Judges 2:16 says that when “the Lord raised up judges, who saved them out of the hand of those who plundered them. Yet they did not listen to their judges, for they whored after other gods and bowed down to them. They soon turned aside from the way in which their fathers had walked, who had obeyed the commandments of the Lord, and they did not do so.” Every time “the Lord raised up judges for them, the Lord was with the judge, and he saved them from the hand of their enemies all the days of the judge. For the Lord was moved to pity by their groaning because of those who afflicted and oppressed them. But whenever the judge died, they turned back and were more corrupt than their fathers, going after other gods, serving them and bowing down to them. They did not drop any of their practices or their stubborn ways” (Judges 2:18-19). Just when Samson was born “the people of Israel again did what was evil in the sight of the Lord, so the Lord gave them into the hand of the Philistines for forty years” (Judges 13:1). Manoah and his wife were barren and they prayed to God for a child but after an angel of the Lord appeared to Manoah, they made a burnt offering to the Lord (Judges 13:19) and not long afterwards, “the woman bore a son and called his name Samson. And the young man grew, and the Lord blessed him. And the Spirit of the Lord began to stir him in Mahaneh-dan, between Zorah and Eshtaol” (Judges 13:24-25) but Samson proved to be a rebellious man who’s passion for women would lead to his destruction. When “Samson went down to Timnah, and at Timnah he saw one of the daughters of the Philistines. Then he came up and told his father and mother, ‘I saw one of the daughters of the Philistines at Timnah. Now get her for me as my wife.’” But his father and mother said to him, “Is there not a woman among the daughters of your relatives, or among all our people, that you must go to take a wife from the uncircumcised Philistines?” But Samson said to his father, ‘Get her for me, for she is right in my eyes’” (Judges 14:1-3) and the phrase, what “is right in my eyes” is very similar to the way everyone else in Israel lived, doing what was right in their own eyes (Judges 17:6) so tragically, Samson was a very poor example since he was destined to be a judge. Interestingly, “His father and mother did not know that it was from the Lord, for he was seeking an opportunity against the Philistines. At that time the Philistines ruled over Israel” (Judges 14:4). God is able to use good for evil (Gen 50:20) to accomplish His will and Samson is a great example of that. Samson, even though his heart was not right with God, still destroyed many of the Philistines (Judges 15) which was God’s purpose all along. On one occasion, “Samson went to Gaza, and there he saw a prostitute, and he went in to her” (Judges 16:1) but “After this he loved a woman in the Valley of Sorek, whose name was Delilah. And the lords of the Philistines came up to her and said to her, ‘Seduce him, and see where his great strength lies, and by what means we may overpower him, that we may bind him to humble him. And we will each give you 1,100 pieces of silver’” (Judges 16:4-5). Delilah approached Samson and “said to Samson, ‘Please tell me where your great strength lies, and how you might be bound, that one could subdue you’” (Judges 16:6). Eventually, it was discovered that his strength lay in his long hair and after his hair was cut, the Spirit was departed from him. What a sad picture now of Samson who after “the Philistines seized him and gouged out his eyes and brought him down to Gaza and bound him with bronze shackles. And he ground at the mill in the prison. But the hair of his head began to grow again after it had been shaved” (Judges 16:21-22). Now, Samson being reduced to a blind spectacle before the Philistines who called him “out of the prison, and he entertained them. They made him stand between the pillars” (Judges 16:25). There were thousands of people here for this special occasion and humiliating Samson after all he had done to them was the best entertainment they could have had and you know they must have really enjoyed it. Samson prayed one last time to God “O Lord God, please remember me and please strengthen me only this once, O God, that I may be avenged on the Philistines for my two eyes” (Judges 16:28) and cried ‘Let me die with the Philistines.’ Then he bowed with all his strength, and the house fell upon the lords and upon all the people who were in it. So the dead whom he killed at his death were more than those whom he had killed during his life” (Judges 16:30). Samson’s short rule as a judge was for 20 years, half of what was typical. Don’t be too hard on Samson because he shows up in what we call “the Hall of Faith” in Hebrews 11 where it says, “And what more shall I say? For time would fail me to tell of Gideon, Barak, Samson, Jephthah, of David and Samuel and the prophets” (Heb 11:32) and since he shows up there, we can presume that we will see him in the kingdom.